Happy Summer! We’re pleased to announce that we have new cover art and new release dates ready for Treesong‘s existing and upcoming titles. Treesong is hoping to build momentum for his sales and writing by relaunching existing titles, releasing two new ones, and making plans for future releases. Cli-Fi Plus will be released on August 1, 2018. For details on the latest developments, please read Treesong’s full blog entry. Treesong is offering free short stories to people who sign up for his email list! Sign up today and choose between either the Strange Beginnings short story collection or a sneak peak at an unpublished short story. Share this page on Facebook or Twitter after you sign up and you’ll receive both! On March 6th and 7th, Goodbye Miami: Tales Of An American Climate Refugee will be available for free on Kindle! Goodbye Miami is the latest work of climate fiction (“cli-fi”) by Treesong, an author, community organizer, and talk radio host living in Southern Illinois. Treesong has also written a cli-fi novel called Change and several other works of short fiction and nonfiction. He is currently working on a sidequel to Change called Order and a series of cli-fi and other short stories. Interviews: The author, Treesong, is available for interviews. For more information, email info@cranncheol.com or call 618-525-0625. We are pleased to announce the release of a new climate fiction book by Treesong! Goodbye Miami started as a “cli-fi” blog but is now available as a full-length book. Kass, an American climate refugee, flees Miami in the wake of a hurricane that leaves most of the city underwater. After moving in with her cousin in Southern Illinois, Kass struggles to deal with her displacement. She hopes to find a way to return to the city that she loves. But thanks to global warming, that city is now underwater. What starts as a search for survival quickly evolves into a struggle for the future of Miami — and the world. In honor of Autumn Equinox, the harvest festival of Mabon, and the People’s Climate March, we’re having a Fall Harvest Sale! Starting on Monday, September 22, you can get the Kindle edition of Treesong‘s novel, Change, for just 99 cents. That’s a 75% discount! This is a Kindle Countdown Sale, so the sooner you order, the better your bargain will be. The price will go up a dollar every couple of days until it returns to normal price. Buy your copy today and invite your friends to do the same! We are pleased to announce the upcoming release of a new short story collection! Strange Beginnings is a collection of short stories by Treesong. These tales all take place in the same setting as the author’s first novel, Change, and all relate in some way to the theme of strange beginnings — and often strange endings. The first edition will be an ebook-only edition, but we will also consider a print edition if there is sufficient interest. The release date for Strange Beginnings is May 8, 2014. In the meantime, if you haven’t already, we invite you to read, rate, and review the author’s novel, Change. You’re also welcome to visit Treesong’s author page on Facebook and talk to the author and other readers. 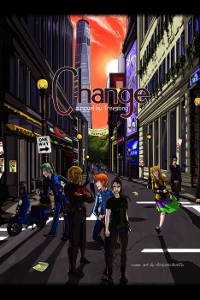 Change, an urban fantasy novel about climate change by Treesong, contains the refrain to a song about climate change. Treesong wants your help completing this song! He is looking for audio/video submissions featuring your completed version of “Here Comes The Tide”. If he chooses your submission, your version of the song will become the official canon version to be published on his website and shared with climate activists around the world. Check out the details on Treesong’s website and help spread the word!